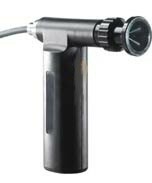 Fibre-glass fiberscope 319 facilitates easy inspections at difficult-to-access points such as in air ducts, ventilators, machines and motors etc. Diagnoses such as corrosion, friction wear, condition of welding joints, loose parts and lots more can be made very early, very quickly and very easily using endoscopy. The flexible319 can be guided through hollow spaces, bore holes and bends. You can adjust the focus using the focussing wheel. In this way the damaged point can be appraised without the need for dismantling. Highly flexible with a bending radius of only 50 mm, with middle flexibility or stiff; extraordinarily versatile applications thanks to different, push-on casings.